Planetes is an anime adaptation of the sci-fi manga series under the same name, written and illustrated by Makoto Yukimura. 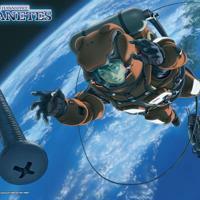 Produced by studio Sunrise under the direction of Gorou Taniguchi, Planetes aired a total of 26 episodes between October 4, 2003 and April 17, 2004. Ai Tanabe boards the ISPV 7 Space Station for her new job, and learns that she is assigned to the Debris Section. She is accompanied by Hachimaki for her first mission, and they’re tasked to deorbit a memorial plate.